At Le Château de Beaulieu in north-west France, local chef Marc Meurin is celebrating. It is the 20th anniversary of his restaurant’s second Michelin star. Meurin is largely self-taught, with almost fifty years of experience under his belt. In all that time he has stayed close to his birthplace. Fourteen years ago, he moved his restaurant, Le Meurin, to Le Château de Beaulieu on the outskirts of rural village Busnes, just an hour from Le Touquet. With its turrets and moat, the chateau, now a boutique hotel, looks like a Disney castle. Standing graceful and sophisticated at the heart of a small park, it reminded me of a similarly moated castle in Kent, although the nineteenth century structure posed more gracefully than the squat mediaeval manor house tucked into a hidden valley in Ightham. From our bedroom window, we gazed over the moat to sweeping lawns, and broad leafy trees spreading their shadows across a swathe of lawn to a small lake edged with irises and belted with a Monet style bridge. Our room was reminiscent of Eloise’s Plaza Hotel with plenty of hot pink and gold. Our first evening there, we dined at the bistro restaurant. Le Jardin d’Alice is contemporary and colourful, overlooking a pretty patio garden. The menu was both creative and delicious, and the menu changes regularly. Although dinner was terrific, I don’t want to be overly self-indulgent, or incite too much food envy, so I will move on to the pièce de résistance: Sunday lunch at Le Meurin. Le Meurin boasts two dining rooms and a lounge area. One dining room is more formal, curtained and carpeted, with upholstered chairs and a chandelier. The second is contained in an airy and gracious wrought iron conservatory, overhanging the moat. 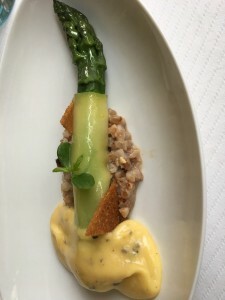 With a choice of four, six or eight courses, the six-course dégustation menu seemed elegant sufficiency for a Sunday lunch, but, as always with a dégustation menu, there were some unscripted extras that added several titillating mouthfuls to the proposed menu. A small platter of amuse bouche arrived first to tantalize the taste buds: a quenelle of salmon bavarois, a parmesan cheese biscuit and a canape of smoked eel topped with beetroot, all intense flavours in dainty serving spoons. Next, an egg shell, neatly decapitated, snuggling in a small nest of hay: an amusing ‘boiled egg’ of cream of lovage soup topped with caviar. Lovage is a leafy plant rather like celery, with leaves like large Italian flat-leaf parsley, but it’s also closely related to carrots and parsnips. The flavour is herbaceous – think parsley and celery combined – with a hint of aniseed and curry. Digging deeper with our teaspoons, we uncovered the ‘yolk’ of butternut pumpkin puree. Light and delicately flavoured, this surprising, somewhat quirky offering set the mood for an afternoon’s gastronomic entertainment. The bread trolley offered up many interesting options and returned frequently throughout the meal. I succumbed only once, to a moreish slice of fig bread, and a lemon bread that was particularly recommended by our waiter. Fresh from the oven, warm, soft and citrusy in the centre, satisfyingly crunchy on the outside, it was served with a choice of salted or unsalted butter whipped to a light mousse. The first official dish on the menu was a cube of pink trout served on a cushion of buckwheat floating in a sea of green samphire sauce. Topped with a purple clover flower, the colours were disarmingly extravagant and bold, yet the taste was subtle and fleeting, each mouthful feather-light and delicately textured. Next, a luscious spear of green asparagus arrived, tender as a courgette, cloaked in a thin slice of cheese, and bathed in a light, creamy sabayon. A bed of barley and walnuts, and two tiny triangles of fried bread added a dash of crunchy texture. The asparagus almost melted on the tongue and drifted down my throat as smoothly as a glass of warm milk. A dish of firm, sweet scallops and grilled prawns was accompanied by a soft, off-white oyster juice marshmallow, full of briny flavour, cradled on an oyster leaf to prevent it melting on the hot plate. The much-anticipated foie gras proved to be a generous and delectable wedge of rich and creamy luxury. Pan fried and drizzled in aged balsamic, it was sprinkled with a crumble of breadcrumbs fried in the goose fat. Beside it, an arrangement of candy striped, deep pink rhubarb fingers and a quenelle of ruby-red rose jam added eye-catching, flamboyant colour, accessorized with another purple clover flower. For the main course, we had a choice: fish or lamb. The One & Only chose turbot, gently steamed and served on a sauce of juniper and onion juice, succulent and melt-in-the-mouth. I succumbed to the lamb, as I usually do. It was beautifully rare (not two words I usually like to string together in relation to lamb) and splashed with a tomato gravy. It was accompanied by piquillos farcis (sweet pepper stuffed with paella) and zucchini tian, a stack of yellow and green courgettes interspersed with slices of chorizo. The lamb was perfect, but it did play second fiddle to the vegetables, and the gravy, while it looked lovely, seemed an unnecessary addition to a dish already vibrant with strong flavours. 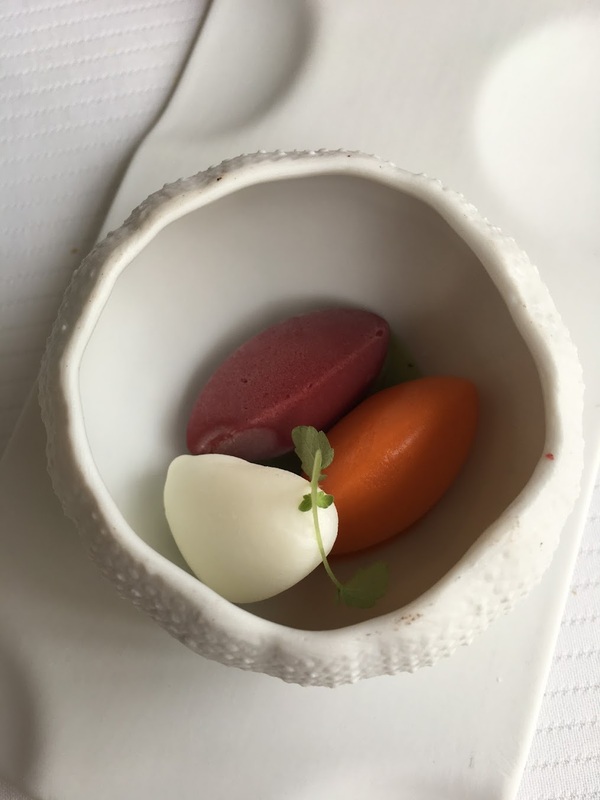 Before we chose dessert, we were presented with a super little palate cleanser: a palm-sized ceramic sea urchin cradling quenelles of ice cream in vibrant colours and surprising flavours: bright orange carrot, creamy white asparagus, and a claret coloured beetroot. The cheese trolley swept in, laden with a healthy array of local cheeses, pushed by a waiter armed with a generous hand. Of the two desserts on offer, we all opted for the morels and chocolate, an adventure in taste and texture, not to mention visual delight. The centrepiece was three ribbed morels, piped full of white caramel chocolate. These stood to attention like tiny tree stumps, the ‘forest floor’ scattered with chocolate ‘dirt’ and soft bread torn into pieces and coloured green to look like moss. Twigs of rolled milk chocolate and meringue mushrooms completed the woodland scene. The inevitable sauce was flavoured with orange and espelette pepper, a treasured chilli of the Basques. As a grand finale, the Lolly Trolley arrived, bedecked in sweet treats to rival the Child Catcher’s van in Chitty Chitty Bang Bang. Many-coloured, handmade cubes of marshmallow, lollypops galore, toffee apples, macarons and coloured pieces of Lego chocolate. There was even barbe de Papa (fairy floss). Like a day at Willy Wonka’s Chocolate Factory, even the adults couldn’t resist the temptation! And I haven’t forgotten the wine, although given the drive home, we showed unusual restraint. Daunted by the encyclopediac leather-bound menu, we had a lengthy discussion about the wines available – all French – with the knowledgeable and chatty sommelier. We finally settled on a Saint Emilion Grand Cru, Chateau Dassault 2012, deep red and thick with tannin. And later, when we felt all was over, the sommelier sweetly poured me a glass of dessert wine that tasted as rich and raisiny as Muscat. A moment later, a dish of chunky but diaphanous chocolate honeycomb appeared like magic, that melted on the tongue before you could blink, leaving behind a satisfying whisper of chocolate bubbles. *With thanks to Google images for the photo of the chateau. 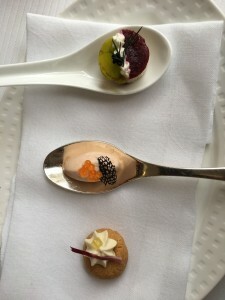 This entry was posted in Food & Wine, France and tagged Amuse Bouche, Busnes, foie gras, France, Le Château de Beaulieu, Le Meurin, Lens, Marc Meurin, piquillos farcis. Bookmark the permalink.